In case anyone still had any lingering reservations about Dr. Oz's quack status, he removed all doubt in his recent endorsement of astrology. Just to clarify, that would be astrology, not astronomy. The latter is a real science that studies the universe; the former is what fortune tellers and tabloid newspapers use to dupe gullible people into buying their products. It's not even fair to call astrology "junk science" or "pseudoscience," because that implies astrology is at least based on something resembling science. But it is not. It is unadulterated charlatanism. The positions of Jupiter and Venus in the night sky have absolutely no relevance to your life -- unless you own a telescope. Yet, here's what America's Quack had to say about astrology on Twitter. (See screenshot.) Let's dissect this statement, line by line. So what? For centuries, some societies performed ritual human sacrifices and blamed witches for causing disease. For millennia, people have practiced Traditional Chinese Medicine. Just because a society has always done something, doesn't mean it works. "...we have used astrological signs to examine our personality and how we interact with those around us..."
There is no conceivable biological mechanism by which the position of Uranus influences your personality. That's right, I said Uranus. 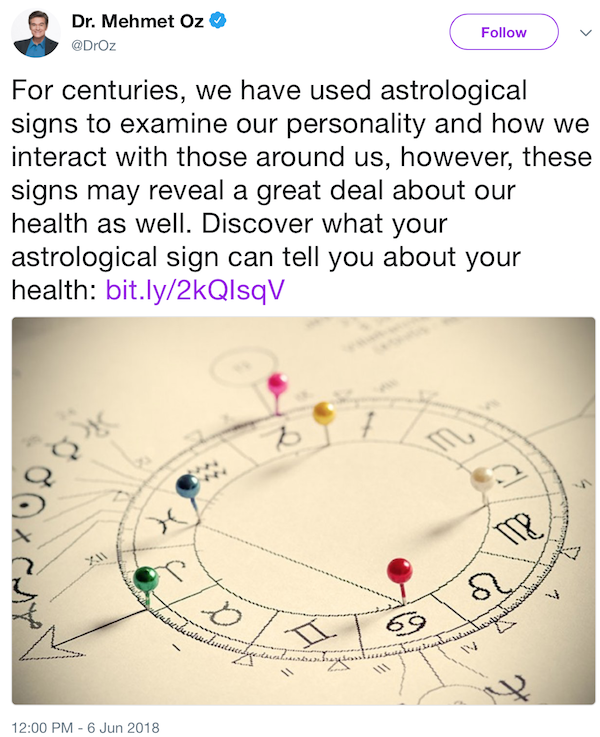 "...these signs may reveal a great deal about our health as well." See above. There is no conceivable biological mechanism by which the planets or stars or comets or anything celestial can affect your life -- unless a meteor smashes into your house. As of 2014, he had advocated for at least 16 different miraculous weight loss regimens. Additionally, according to Forbes, Dr. Oz talks to the dead, says that 200 orgasms per year will extend a person's life by six years, endorses Reiki healing, and claims that his wife and kids use homeopathy. Additionally, he gives a national platform to anti-vaxxers, charlatans, and conspiracy theorists. Dr. Oz is what would happen if Alex Jones and Mother Jones had a baby. Yet, he will be given even more prominence, as President Trump has appointed him to the President's Council on Fitness, Sports, and Nutrition. In 2018, facts and reality simply don't matter. Editor's Note: My friend Robin Siskel posted this on the internet archive/wayback machine so that even if Oz eliminates his page it's there for posterity.